A flexible gas line is used to connect a home appliance to a natural gas source. Plumbing companies Boston MA offers DIY guides, tutorials and tips to help the handy homeowner through some plumbing jobs around the home. In this post, plumbing companies Boston MA tackles installing a flexible gas line. 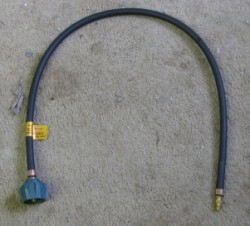 A flexible gas line is used to connect a home appliance to a natural gas source. Flexible line is used instead of a rigid black steel pipe when the appliance in question is bound to be moved after installation. (For example, you may need to adjust its position or clean under it.) Flexible gas lines come in pre-packaged corrugated flex lines that work for short to moderate distances while soft copper plumbing tubing is recommended for covering longer distances between the gas supply line and the home appliance. You will need to purchase a flexible line with an extra foot in length, and brass fittings suitable for connecting to the gas supply line and on the gas-powered appliance. When working with the flexible line, take care not to kink or bend it sharply since this could cause damage where gas could leak. Cut the flexible line to cover the distance between the supply line and the appliance, leaving at least six inches of extra length. If using soft copper, use a pipe cutter. Apply the brass fittings to both ends of the flexible line. If you are using threaded fittings, apply some pipe joint compound to the male threads first. Apply a flare nut into each end of the pipe and tighten the tubing to the fittings on both ends. Now that the flexible line is in place, check if you have an airtight seal. Turn the gas on at the valve. Dip a sponge in a soap and water solution and run it to each joint. Observe if there is any bubbling which indicates a gas leak. If any gas is leaking, you need to start to dismantle the line and start over. Never disregard any gas leaking, no matter how miniscule. It could explode or cause a fire. If in doubt, call a professional.